This year has flown by and now we are at my last post of 2012. Like last year, I end with a run-down of my 10 most memorable restaurants/meals of the last 12 months. On my list are two San Diego restaurants and another, which has made my list two years in a row. Thank you to all my readers who have come along for the ride and I hope you will continue to journey with me as we embark into the new year. I start my “best of” with a casual spot close to home. Mick’s Karma Bar is a small space offering up burgers, and they only have five on the menu. You can choose from a beef, turkey or veggie pattie with a bunch of different toppings, but that’s it. There is also a fish taco on the menu. Order the strawberry basil lemonade as well, it’s seriously addicting! Michael Schepers, owner of Mick’s keeps everything simple, but it is always absolutely delicious! 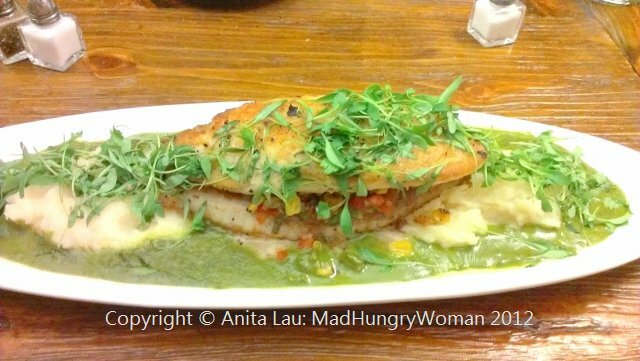 I’m a huge fan of Lucca Cafe and its chef Cathy Pavlos. Chef Cathy is the warmest, most hospitable woman I know and her passion for food shines through in her wonderful dishes featuring seasonal produce and using the simplest of ingredients at its prime. I love the Sunday Suppers usually held monthly and features an eating debauchery shared family style. Last year, I featured Anepalco’s Cafe on my year end list. This year, Anepalco’s Cafe opened its second location at Ayres Inn in Orange and there was never a doubt they would make it onto the list this year. Chef Danny Godinez has taken his breakfast and lunch menu to a whole new level by offering dinner at the new location. His dishes reflect his Mexican roots with his experiences in traditional French cuisine. The result is using French techniques and marrying them with bold Mexican flavors. You’ll have to taste it to believe it. When Mokkoji Shabu Shabu opened this year, I must say my son and I visited so often that when I received my credit card statement, I was shocked at how many of the charges were from there. Chef/owner Tommy Kim, an alumni of the St Regis Hotel uses his fine dining experiences to create an experience like no other. This is THE best shabu places in Orange County. Once you’ve tasted the difference, and experienced the extra mile they go to make your meal delightful, you won’t go elsewhere. One of the biggest surprises this year has been a little place in San Diego which offers some of the most delicious food I’ve had in a while. Cafe 21 has an incredible breakfast/lunch menu with fantastic pancakes and even better egg dishes. However, their dinner menu also blew me away with fresh, great quality produce, superb proteins leaning towards a Mediterranean feel. 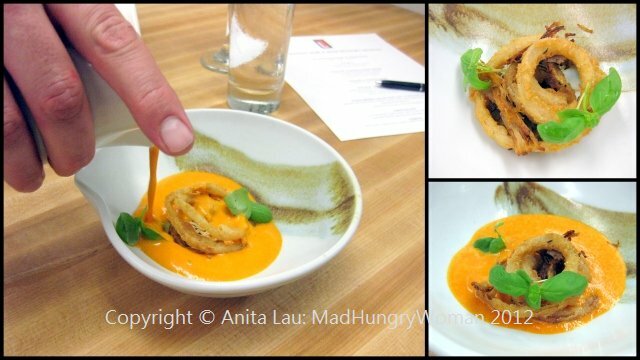 Cafe 21 has become a favorite of mine in southern California and they deserve every bit of success they’re receiving! On the topic of San Diego, I was pleasantly surprised by Isola Pizza Bar where the pizzas are thin and delicious. 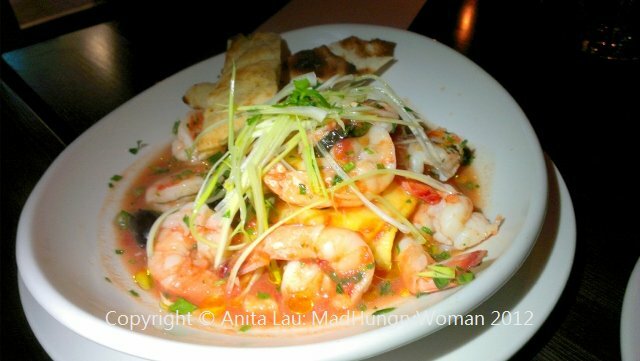 Wines are from the owner’s family vineyard and everything they serve is cooked in the oven they imported straight from Italy, including the shrimp dish pictured below. The Ranch seems to be one of those places where my friends and I go to celebrate something special. Early this year, I celebrated a friend’s birthday here during restaurant week. Then, last month, I celebrated my birthday here with 11 of my friends for dinner. It was a fun-filled evening with delicious food and wine. I returned for a wine dinner a few nights later and that was an absolutely stunning pairing of food and wines. 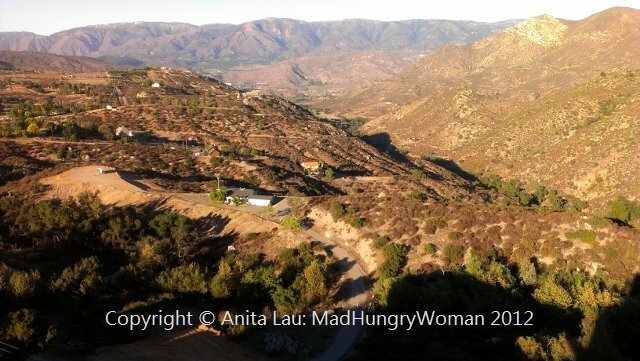 The Ranch remains one of my favorites in Orange County. This year, The Landmark in Corona del Mar was renovated into a chic, trendy space with new owners and a new chef worthy of praise. Chef Travis Flood, a native San Diegan comes with an impressive resume including Fifth Floor in San Francisco, working under Laurent Gris. The menu is true fine dining style paired with comfort food kicked up a notch or two. Definitely worth a visit. My new favorite sushi place is Shunka, a little place in a non-descript mall in Costa Mesa. The restaurant serves up beautiful sushi using best quality fish, some of which are imported from Japan. I highly recommend sitting at the sushi bar and ordering omakase and let the chef take you on an incredible ride. Unfortunately I haven’t written up a blog post about Shunka, but this is my go-to place whenever I’m hankering for some top quality sushi close to home! Last but not least, this fantastic fine dining establishment recently got a new chef and a new seasonal menu. The hand-made pastas are created in house and definitely worth ordering. They blew me away as I haven’t had anything like this since my trip to New York in the fall. Andrea Ristorante offers spectacular views and if you get there at the right time, you can watch the sunset over the Pacific. Well, that’s it! Thanks to all of you who have followed my blog this year. I love all the comments you leave and appreciate your support and enthusiasm! See you all in 2013 and I hope to bring you more tasty places to visit in the new year! My friends and I visited Valley View Casino out in Escondido a little over a month ago. None of us are real gamblers so we didn’t actually hang out at the casino until later in the evening. 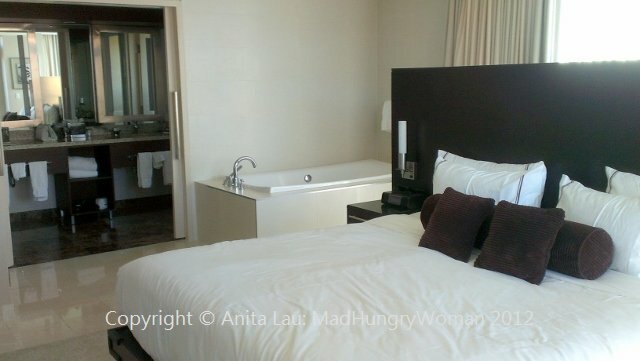 When we arrived, we swiftly checked into our rooms to chill before embarking on our dining experience for the night. 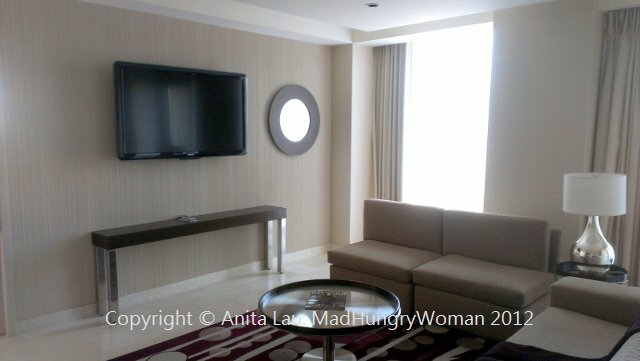 I was rather impressed with my suite. The living room was large enough to entertain friends (so I invited mine over to share in the wealth) with a dining room table. The living room is separated by a door into the bedroom, complete with a bathtub outside of the bathroom. There is also a large shower and two sink vanity so you’re not fighting for space with your partner or whoever is sharing your room. 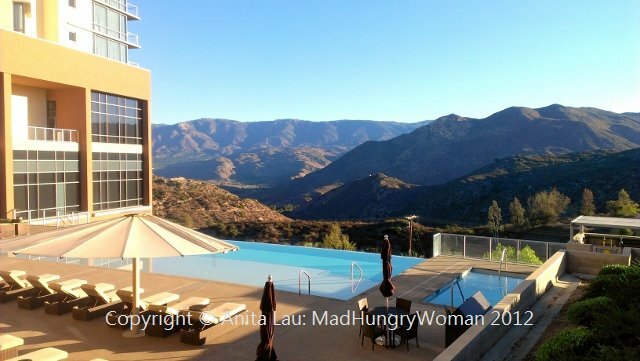 The balcony offered a view of the mountains. I also wished I had known about the fantastic pool they had, I would’ve brought a bathing suit. 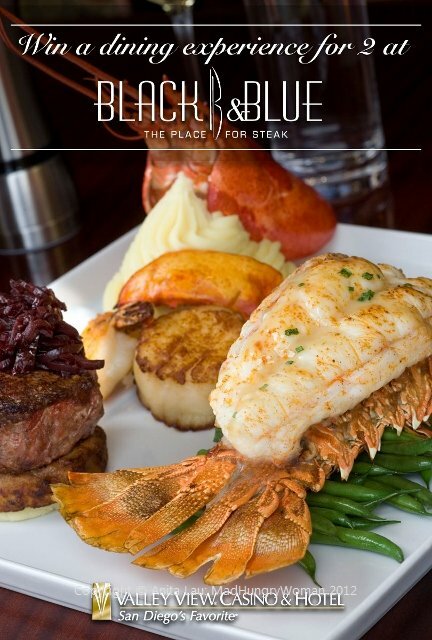 When the time came to step out, we made our way through the jam-packed casino and to Black & Blue restaurant, the casino’s fine dining establishment. I loved the aquarium which runs alongside the restaurant from the bar into the restaurant which is decorated in dark mahogany hues. Our server was a sweet gal who was very patient with us as we took our time deciding what we wanted to order. 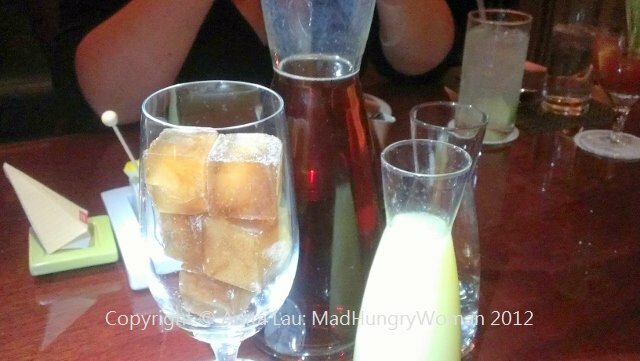 If you don’t drink alcohol, start with one of their decadent house special iced teas ($). The ice cubes are made from iced tea which means when the cubes melt, it doesn’t water down your tea. They also give you freshly squeezed lemon juice. It was SOOOOO good! 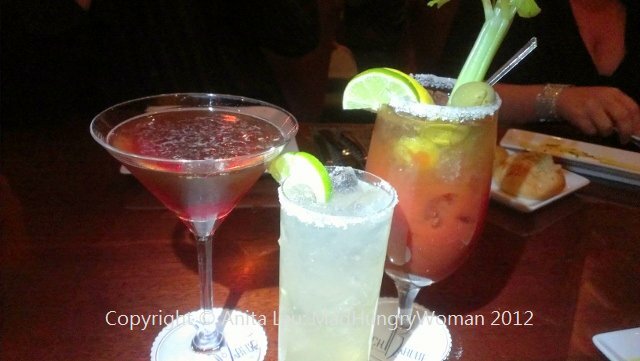 If you’d like a cocktail, choose from a bloody Mary, margarita or Manhattan, all of which were decent. The margarita was my favorite! 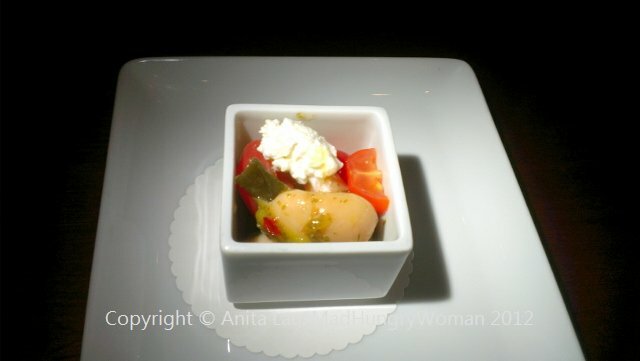 An amuse bouche of gigante beans and feta was brought over. It had some cherry tomatoes tossed in and a touch of olive oil. A nice way to start our meal. I was so impressed by their bread service. They had a delicious roll topped with cheese, another walnut whole wheat was also awesome, but I think our favorite was the brioche which was light and fluffy and oh so buttery! 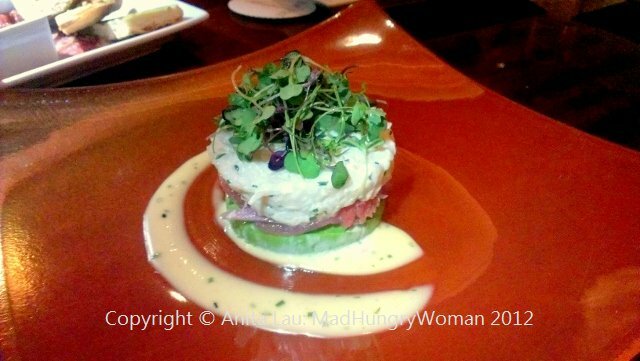 Our Lobster Avocado Tower ($12) was quite tasty. Lobster meat with avocado was laid on top of one another and each bite encompassed a little of each into a a mouthful. We all enjoyed this one. Smoked Mozzarella ($12) was a little misleading as it wasn’t just smoked mozzarella, but an antipasto plate WITH smoked mozzarella. 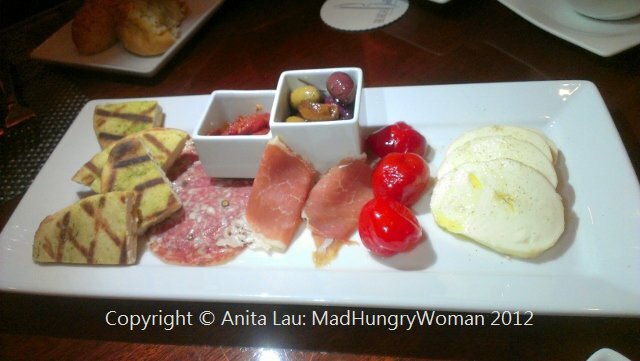 We had some prosciutto, salami, olives and blistered cherry tomatoes as well. 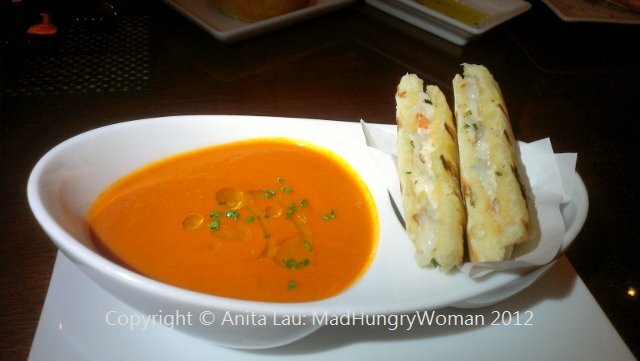 I loved the Tomato Bisque & Lobster Panini ($8), well the tomato bisque of it anyway. It was nice and tart just the way I like it. Unfortunately, the bread on the panini was too soggy although the lobster was really nice. Our entrees were pretty good. 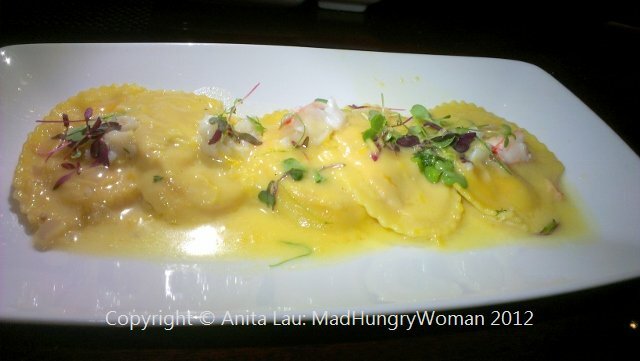 The Lobster Ravioli Zafferano ($28) was pillowy and had nice chunks of lobster hidden inside. Steaks were seasoned well and the Cowboy Ribeye 20oz ($39) was huge, perfect for a healthy appetite. 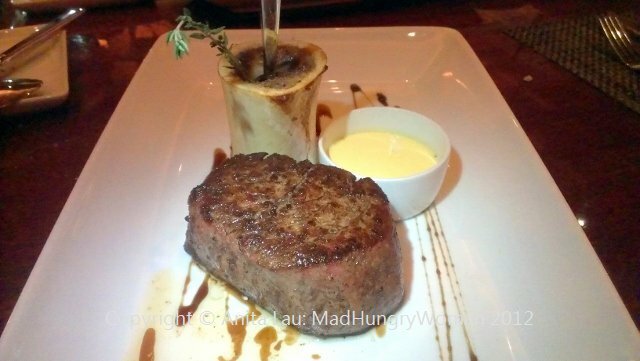 I personally enjoyed the Filet Mignon 10oz ($36) immensely. The meat was tender, flavorful and cooked a perfect medium rare. 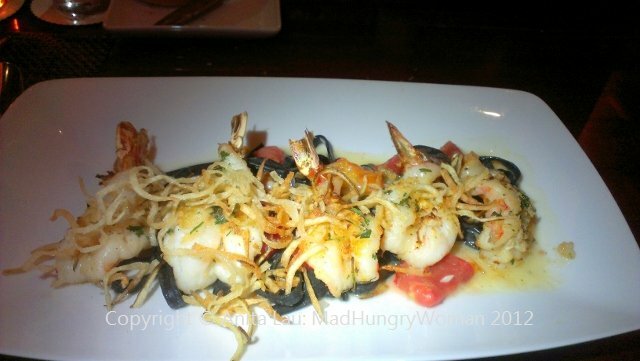 Garlic Prawns ($29) were served with squid ink pasta which was rather delicious. Shrimp was a tad overcooked, but the squid ink pasta more than made up for it. 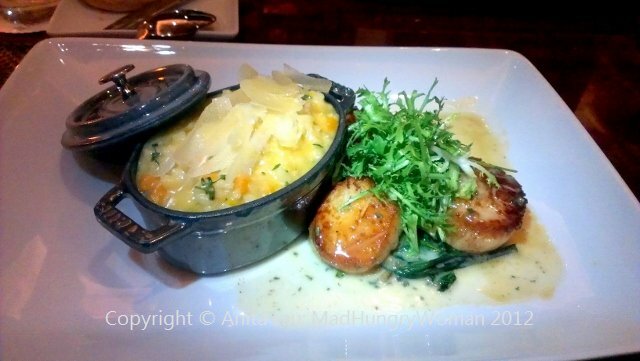 The evening’s special was Seared Scallops ($) served with pumpkin risotto in a baby cast iron pot. Loved the scallops — so tender, seasoned and seared perfectly. 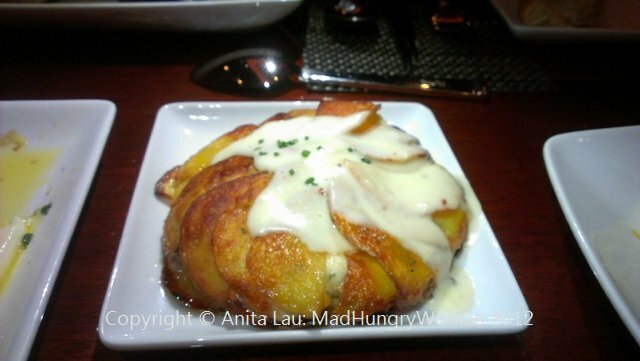 My favorites of the sides were Potato Galette ($7), a really lovely, skillet-baked scalloped potatoes with gooey cheese. 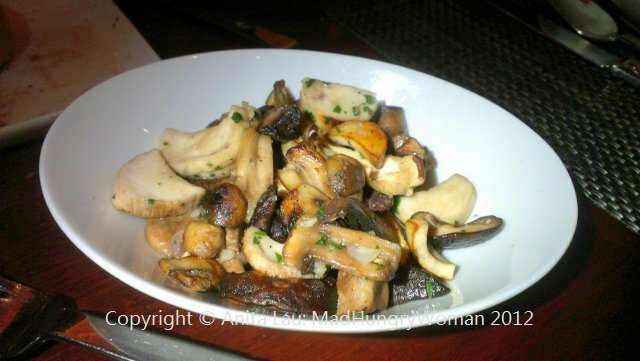 The Forest Mushrooms ($7) were out of this world. A flavor-filled medley of King oyster mushroom, cremini and shiitake complemented the steaks perfectly. 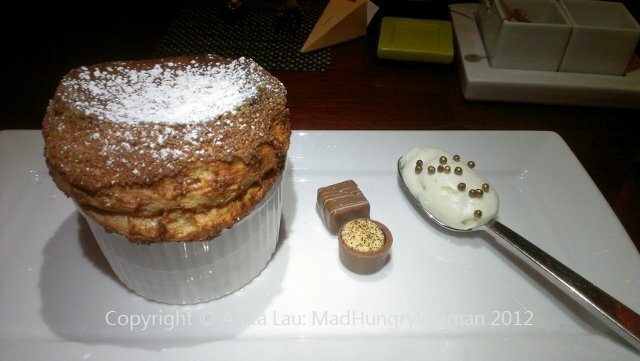 End your meal with a souffle, it takes 20 minutes so order yours when you receive your entrees because it will take that long to execute. It is well worth it! A spoonful of flavored creme with tiny golden malt balls is served alongside for you to dip into the souffle and swish about a little to incorporate the flavors within. Valley View has generously offered one of my readers dinner for two at Black & Blue and an overnight’s stay at the casino’s hotel. Come up with something catchy as to why you deserve to win this and you could be the winner of this getaway package. Only entries with FULL name will be considered. Best of luck! Entries close on Sunday. I recently visited Greenleaf Gourmet Chopshop after seeing all my friends check in there on Facebook. I was confused. Is it a steak house? But “greenleaf” sounds vegetarian. All of my questions were answered when I walked inside and perused the menu. The simplest way to explain Greenleaf is “a fast casual version of True Food Kitchen”. The restaurant is beautiful and embodies the ‘green’ look throughout. There is a little store connected to the dining room where you can find sauces, olive oil, and other gourmet food on the shelves. There are pre-packed sandwiches in the refrigerator case for those on the run. Gourmet coffee and teas are also available here. We were here in the day time so breakfast was being served. We also were able to try some lunch items as well. Mexplosion Omelet ($9) is perfect for those wanting something healthy. An egg white omelette, with black beans, corn salsa, tomatoes, red onion, cilantro, jalapeno jack cheese and avocado, this vegetarian dish is tasty and filling. You can always add meat to it for an extra charge. The Breakfast Pizza ($10) looked so interesting so naturally we had to try it. Spicy turkey sausage, roasted potatoes, goat cheese, baby arugula and pecorino on a non-traditional pizza crust is completed with a sunny side up egg. The latter oozes as soon as my knife pierces it creating a creamy texture throughout. From the lunch menu, Antioxidant Orchard Salad ($10.95) was not only colorful, but also, delicious. The salad is layered with Scarborough farms baby mixed greens, grapes, celery, walnuts, dried cranberries, apples, blue cheese, mint, red onion, cucumbers, strawberries and blueberries, with a pomegranate whole grain vinaigrette served on the side. The salty sweet flavors were right up my alley. 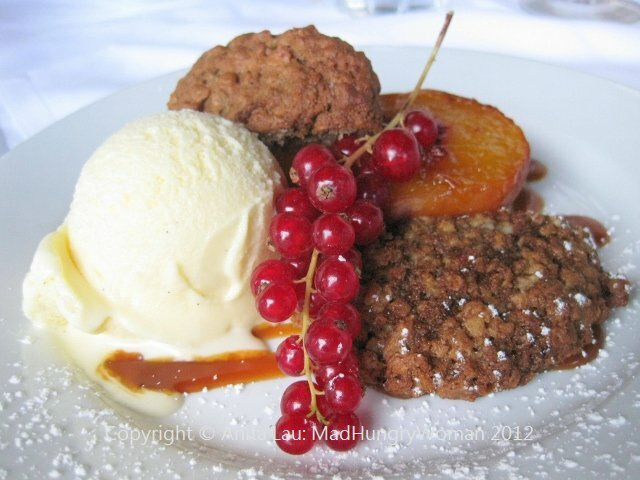 I loved the crunch from the walnuts and the beautiful antioxidant fruits were plump and vibrant. What’s better than a sandwich for lunch? Chicken Avocado Panini ($9.95) has generous chunks of chicken with pesto sauce and avocado sandwiched between whole wheat bread and toasted. I enjoyed this a lot but was not able to finish the whole portion. This is a really great place for breakfast, lunch or dinner. 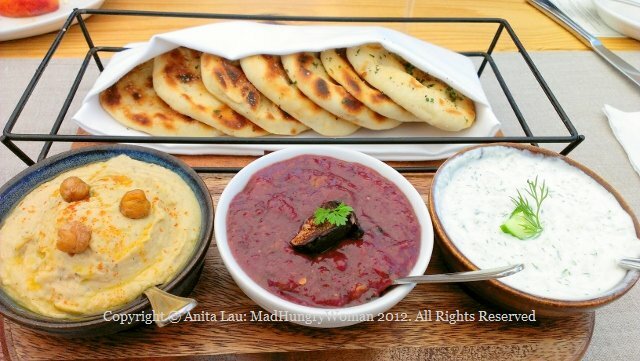 Quality produce is prepared in a healthful manner, giving diners the opportunity to create their own combinations whether it be with meat or not. The space is gorgeous and there is free wifi for those who want to linger and take advantage of the inviting environment. I was invited to preview the Autumn menu at Andrea Ristorante a few weeks ago where not only were we treated to delicious fare, but also, introduced to the restaurant’s new chef, Luigi Fineo, a native of Gioia. We began with cocktails on the terrace before moving into the dining room’s patio area. The sun was just setting and the glorious pink and orange hues were visible on the horizon as we sat down to sample an array of what the season has to offer. 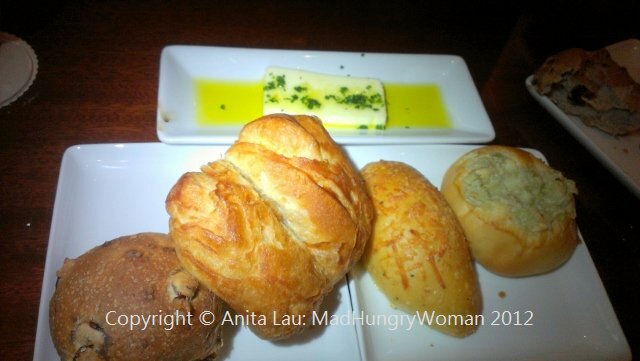 Bread service of three different types of bread arrived with foccacia, a whole wheat roll, and another with scallion. I’m told all breads are made in-house. We started with House Cured Duck Breast Carpaccio, “Cervia” rock salt, mild gorgonzola dressing ($18) — so delicate, so packed with flavor, OH SO GOOD! I could’ve eaten another plate of this! Sicilian Pistachio Pappardelle with braised lamb ragu ($23) was next. I haven’t had pasta this good since being in NYC several months ago. All pasta is made in-house and the difference is immediately evident when you taste it. The pappardelle has the perfect texture and the lamb ragu is rich and unctuous. A wheel of parmesan reggiano was brought tableside to showcase the next dish. Porcini Mushroom Risotto ($29) was poured into the wheel and mixed together so the cheese can coat the risotto before it is spooned into a pan and served to us. Fresh porcinis are delicate and subtle — not as intense in flavor as the dried version — while the rice was just perfectly executed. There was a hint of cheese, not overpowering whatsoever. Note that the table-side presentation requires a minimum of two orders. Our next home made pasta was a ricotta Cavatelli with langoustine, chanterelle mushrooms and brown butter ($25). When you come to Andrea, I highly recommend getting any pasta dish because you won’t be disappointed. The cavatelli were delightfully toothy and the langoustine so sublime. I would have a huge problem when I return because I won’t know which to order, this or the pappardelle! I didn’t have much room left for the Greg Norman Wagyu Tenderloin Grade 9 with roasted vegetables, cipollini onions, and bone marrow (8oz/$70) but it was a perfect medium rare and I couldn’t resist. 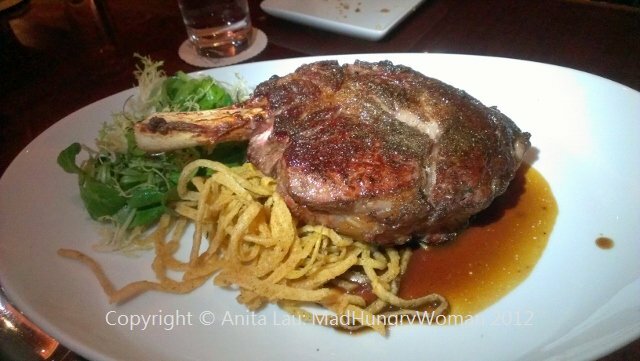 If you’re an avid meat eater, this is definitely the dish for you! Chef Luigi couldn’t have known that zabaglione was my absolute favorite dessert of all time, so Vanilla Sabayon with Passito Wine Baba ($15) balsamic fig compote and whipped cream was really hard to pass up. I love sabayon, or, zabaglione, and this was like eating little bits of puffy clouds. My giveaway this week is for Andrea’s Pranzo Veloce, the quick lunch which runs from Wednesdays through Sundays. The two-course menu espresso (express menu) is served in 45 minutes or less. The giveaway includes this lunch for two at Andrea Ristorante valued at $60. Leave me a comment as to why you should win this delightful prize. Please see below for restrictions. The gift voucher expires December 31, 2013 and reservations are based on availability. 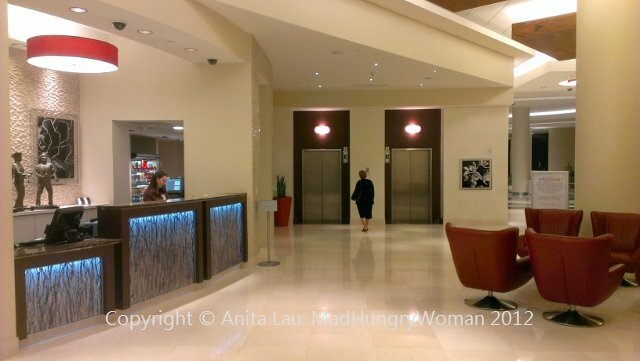 Dining credit for Andrea only, does not include alcohol, tax or gratuities – not to exceed $60. Cancellations or changes to reservations must be made 7 days prior to arrival to avoid forfeiting your certificate. Certificate must be rendered upon presentation of final bill. Certificate has no cash value, is non-transferable and may not be combined with any other offers or promotions. Some restrictions and blackout dates may apply with major restrictions during summer months. Not valid during special events, holidays or holiday weekends. Strictly not eligible for extension. May not be replaced if lost or stolen. The OC Fair is once again hosting the New Year’s Eve Block Party this year and if it’s anything like last year’s bash, you can be sure it’ll be a blast! For entertainment, there will be more than 10 cover bands taking the stage. Feast on food from gourmet food trucks. This will be a party without the black tie but definitely be full of fun! For information on tickets, please click here. Click here for more information on the Block Party itself. To WIN a pair of tickets to this event, leave me a comment and tell me who you will bring to the Block Party and what you are most looking forward to. Entries close on Saturday, Dec 15th. See you at the Block Party! !